It seems nurturing cows – arguably the most lucrative economic instrument for a poor Indian engaged in farming – is no more an article of economic faith. For over a year, government restrictions and regulations and extra state players’ vigilantism against trading in cows and livestock have already crumbled this economy of the poor. Reports from Madhya Pradesh, Rajasthan, Uttar Pradesh, Jharkhand and Chhattisgarh show that animal markets have reported less than 60 per cent business than usual in the last one year; prices of cows and buffalos have crashed by over 50 per cent. While the Union government has withdrawn its controversial trade regulations, it seems the states are now further tightening their curbs on it by proposing new laws in the name of cow protection. Such is the fear of unofficial but unabated raids on livestock trade that many towns and cities have reported increase in stray cows and buffaloes. These are mostly unproductive cattle sold by owners but now being abandoned. The Madhya Pradesh government has been working on a law that would make abandonment of cows an offence and punishable under the Indian Penal Code. Further to it, districts collectors will get power to book owners of cows. Madhya Pradesh’s Animal Husbandry Minister Antarsingh Arya recently confirmed that his ministry is already considering this proposal even though it has not been sent to the cabinet for approval. The proposed law was recommended by the Madhya Pradesh Cow Protection Board in November 2017. “We want to introduce a penalty for owners who abandon their cows. The penalty will be slapped even if a cow is killed in road accidents because it’s proof that the owner has abandoned it,’’ told Swami Akhileshwaranand, chairman of the executive council of the Madhya Pradesh Cow Protection Board to media. The state is already implementing a pilot project in four districts to tag cows for “protection”. The state assembly has many times debated the menace of stray cows and crop damages by abandoned livestock. Many say that an anti-cow slaughter law way back in 1955 led to farmers abandoning cattle that led to widespread crop damages in Bundelkhand areas. It still continues. Interestingly, Haryana, which declared the intention to be the country’s first stray cattle-free state by August 2015, has proposed to send its stray cattle to Madhya Pradesh. But the big question is: will it help “conserve” cows? No. Rather constant restrictions and a regime of conservation purely based on “faith” or “sentiment” will make cows a pariah breed. As indications are already there, people are showing signs of quitting economically important cattle rearing, particularly cow. The proposed law of MP by making an owner responsible for abandonment a crime would be the proverbial last nail on the coffin. An owner abandons cattle because after a productive phase a cow is no more economically viable to maintain. His or her best option at this stage is to sell them. Sellers are least bothered what the buyers do with the cattle. But restrictions on trade in recent time means owners take the easiest way out: abandon them. Now, this becoming illegal as well, what should they do? With all probabilities, they would not even own cattle. And it is not a surmise but a reality too close. There are sporadic reports emerging from Haryana and Uttar Pradesh–governments in these states are also rigid with cow protection activities—that indicate many families have already stopped cattle rearing. So, in the long term, who benefits? Not certainly the breed. We have a precedent in the once highly restricted sandalwood trade. In Karnataka, even now it is common to see people weeding out and throwing away nascent sandal plants sprouting in their backyards. The reason is sandalwood is legally a state property, even if it is grown in private land. There is no ownership over the lucrative tree even if it is growing in one’s own land. But that person would be responsible for its well-being; if it is stolen the owner would be the first person for legal actions. A 1792 edict by Tipu Sultan, the ruler of the then Kingdom of Mysore, added to the problem. Under the edict, sandalwood was declared a royal tree. Karnataka and Tamil Nadu later adopted the edict and kept sandalwood under government control. But this did more harm than good as many legal obligations were imposed on sandalwood cultivation. These restrictive laws led to a thriving black market for sandalwood, and it gave birth to the bandit Veerappan who traded in sandalwood from Karnataka’s forests illegally. On the other hand, government also lost the dominance in sandal trade globally, while other countries took our place by allowing people to take sandal plantation in their private lands. Finally, in the early 2000s, government allowed private plantation but again with restrictions on sale. For example, private growers of sandalwood can sell it only to government agencies. After more than a decade, it seems there is no boom in sandal trade as expected. Both government and people didn’t benefit out of it. But the smuggling of sandalwood from already depleted forests continues, benefiting many other Veerapans. But there is a difference between sale restriction on sandalwood and cattle. Sandalwood is not an essential economic asset while cattle are, particularly for the poorest who treat them as an insurance against crop failures. But what the sandalwood trade restriction shows that government can’t conserve or protect anything by banning or restricting activities, more so for a basic economic activity. 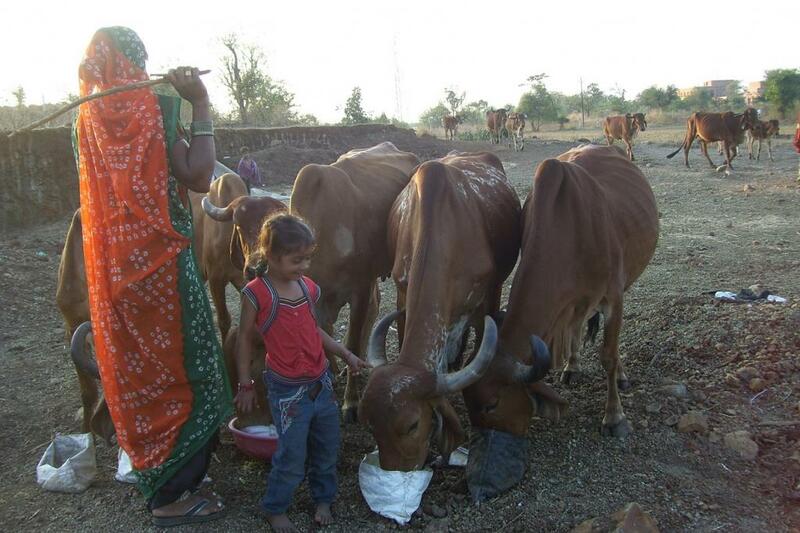 Cows prospered and became a part of our socio-cultural life because it is of survival importance to humans. Dear human beings Earth,plants and animals are basics of nature.they indicate the complete circle of healthy nature in normal course. Due to consistent increase in human population and encroaching human to wards slowly distruction of this natural biological cycle. This interference of human development leads to imbalance of natural growth of planet.we all are facing these ill effects of changing climate.we in mejority and we timely start to control to avoid human encroachment in nature.more and more literacy will help .i and my family members trying to take care and to be with nature.